Japan earthquake, tsunami, fight over time for prevention of radiation explosion, thousands of dead people, Libya… seems like the world is shaking and the comfy zone of your unaffected home/office makes you feel slightly guilty you are not doing anything while people are fighting for their lives? Don’t worry, you are not alone. You don’t need to pack your bags and fly out to Japan to help, though. There are plenty of ways you can help online, whether it’s with your wallet or simply with your Twitter account. New technologies make it possible to lend a helping hand with your texts or even with virtual crops. Twitter published a blog post detailing ways you can help with the relief efforts. Not only have they updated Japan’s mobile website with the latest information on the disaster, but they have also published a list of hashtags to tweet and/or follow related to the crisis. A general hashtag that you can use to show your support and best wishes for victims of the crisis is #PrayforJapan. 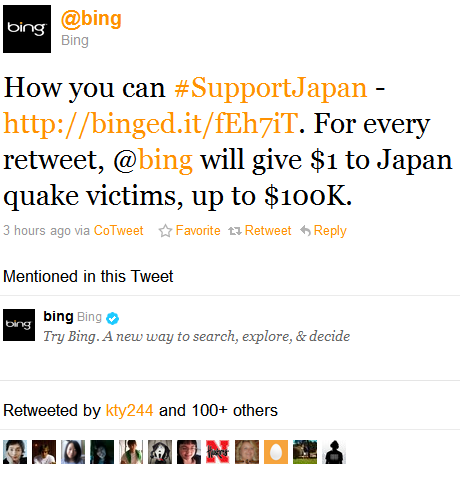 Some companies like Bing saw an opportunity to dress their donation for the victims in a twitter action campaign, and in this case quite successful. They’ve even capped the value they’ll donate at $100k anyway. Given how like people are to hit retweet, because frankly it’s a pretty easy way to give $1 for doing practically nothing, they’re going to have multiplied their Twitter followers exponentially, and reached many people. Among many pages created to show common empathy for victims in Japan, there are also donate per like pages which again make a donation on behalf of a company reflecting the numbers of ‘likes’ they get. The people over at Explore.org are donating $1 for every “Like” of the “Dog Bless You” Facebook page, up to $100,000. Google is also reacting fast to the nature disaster and human grieve and created online database of all survived that can be found from their relatives. Also, if you’re looking for good resources to help the survivors of the Japan quake, Google is doing a good job of collecting a few of the donation pages of the charities active over there at http://www.google.com/tsunami_relief.html. Scoop.it is relatively new but very useful social networking curating platform. 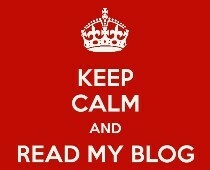 All the information is carefully selected form different people and put together in topics. These days trending topic is “Japan Tragedy. How to help?” which is open for curators and collaboration and can give you much broader choices and ideas on what can you do to help Japan’s recovery. Even a tweet can a make a difference for you, showing simply that you care. For the rest we can only wait and see. As for other dreadful events like the civil war in Libya, the use of social media is preferably restricted among rebellions and their supporters since many of them who have been reporting with videos from the action place and have shared it online, have been prisoned or killed. Now their guide says: Do no use Facebook and Twitter. Content is a king, but imagination is power As brands are no longer doubting the need to communicate through social networks, they are literally polluting all channels with their presence. Many are stealing already realized ideas, others are still afraid to go beyond traditional advertising model.